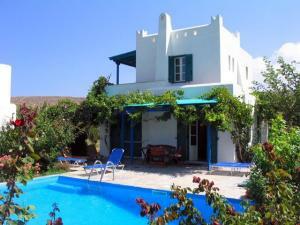 Villas Delona comprises of four brand new maisonettes (apartments) in the country side of Naxos. Situated in the traditional village of Engares in an area untouched from the mass tourism. Each villa promises for its guests privacy and comfort with every house featuring its own private swimming pool. Each villa is surrounded by a spacious veranda and has its own, private swimming pool with hydro massage, fully equipped kitchenette, a living room with a fire place, 2 bedrooms and 2 toilets.